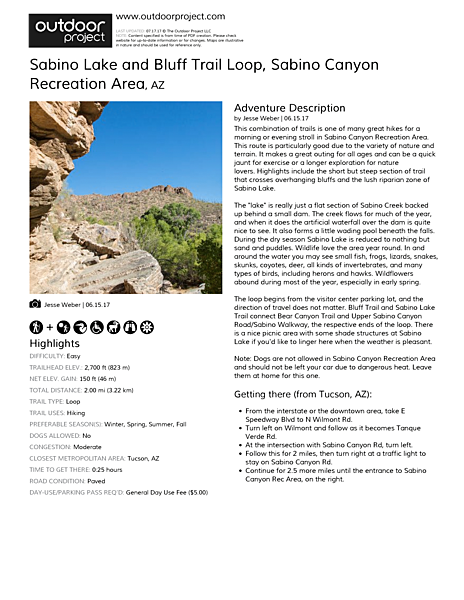 This combination of trails is one of many great hikes for a morning or evening stroll in Sabino Canyon Recreation Area. This route is particularly good due to the variety of nature and terrain. It makes a great outing for all ages and can be a quick jaunt for exercise or a longer exploration for nature lovers. Highlights include the short but steep section of trail that crosses overhanging bluffs and the lush riparian zone of Sabino Lake. The "lake" is really just a flat section of Sabino Creek backed up behind a small dam. The creek flows for much of the year, and when it does the artificial waterfall over the dam is quite nice to see. It also forms a little wading pool beneath the falls. During the dry season Sabino Lake is reduced to nothing but sand and puddles. Wildlife love the area year round. In and around the water you may see small fish, frogs, lizards, snakes, skunks, coyotes, deer, all kinds of invertebrates, and many types of birds, including herons and hawks. Wildflowers abound during most of the year, especially in early spring. The loop begins from the visitor center parking lot, and the direction of travel does not matter. Bluff Trail and Sabino Lake Trail connect Bear Canyon Trail and Upper Sabino Canyon Road/Sabino Walkway, the respective ends of the loop. There is a nice picnic area with some shade structures at Sabino Lake if you'd like to linger here when the weather is pleasant. Note: Dogs are not allowed in Sabino Canyon Recreation Area and should not be left your car due to dangerous heat. Leave them at home for this one. Nature walk. Family friendly. Flowing water.